Raloo Ramblers start their walks around April time and usually stop when the nights begin to close in at the end of August. The walkers meet every Tuesday evening at 7.30 pm, meeting at different venues and finish up around 9.00 pm with tea/coffee/juice and biscuits. This is open to everyone connected in and around the church and everyone is very welcome to come along and get fit as well as having a chat. On certain Sundays, family days out are organised and this has taken the form of a walk and then bringing your own food for a picnic. 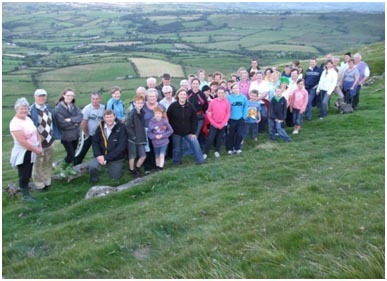 At one of the walks there was a turn-out of over 90 adults and children. Each week you usually end up walking with someone different and they are a very jovial bunch of walkers. Click on the pdf below- there might be a walk which you would like to attend and you would be very welcome. The Ramblers enjoyed their last walk for the 2017 season with a short walk and a meal in The Curran Court Hotel, Larne. There was a good turn out on the evening of Ramblers and Friends and an enjoyable night was had by all. ​The final 2016 walk for Raloo Ramblers took place on the 23rd August for a short walk around Ballynarry as the weather was misty and wet. When they arrived back to their start off point, there was a BBQ awaiting them. Brian and Hilary Apsley provided a short quiz which was very entertaining and then we were provided with a selection of desserts, tea and coffee. Many thanks to Ian and Christine Paisley who came along with their CD player and loads of music to put us through our paces with the slosh and some fancy moves to help us burn off some calories. ​A very enjoyable evening was had by all and money raised, less expenses raised a total of £200 which was donated to the Hall Building Fund.